Home › Home and Kitchen › Simply Charmed Watermelon Slicer Cutter & Corer - Quality Stainless Steel Mel.. 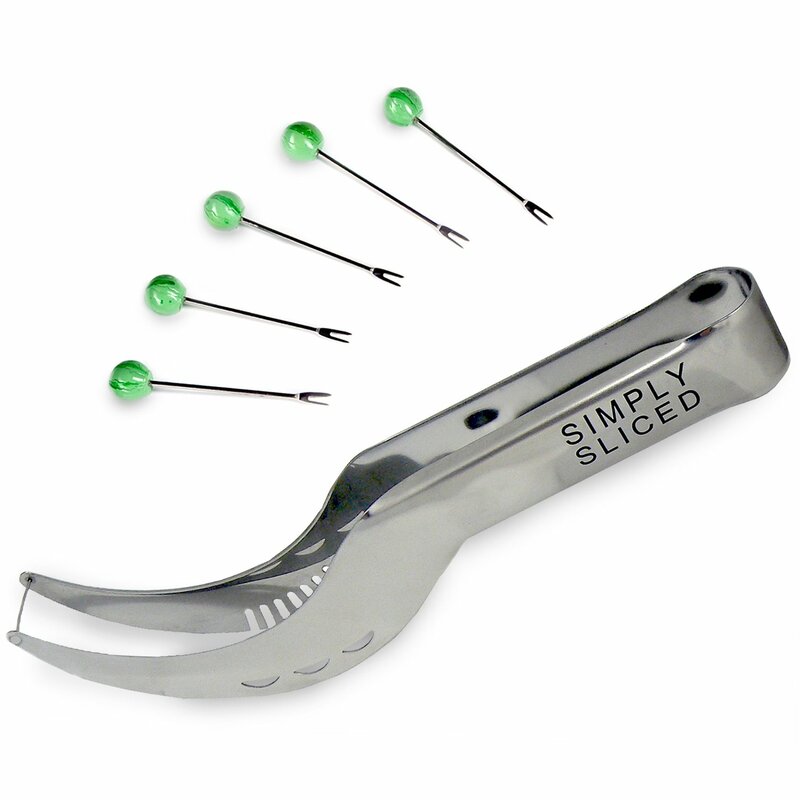 Simply Charmed Watermelon Slicer Cutter & Corer - Quality Stainless Steel Mel.. TRYING TO EAT MORE SERVINGS OF FRUIT? Now its so much easier to feed you and your family healthy side dishes and snacks when you use our safe and clever watermelon cutter. SAVE TIME AND MONEY! With Simply Charmed's slicer & server you'll cut up a watermelon for smoothies or fruit salad in half the time. You will no longer be tempted to buy the over priced pre-cut melon chunks in the grocery store-that have been there how long? WHAT MESS? No need to use half a roll of paper towels to contain the juice that normally cascades over the countertop. You can slice the melon straight out of the rind, which captures all the juice like a bowl. Use the slicer to clean out the rind and replace the watermelon chunks for a creative presentation - use bonus watermelon picks as fruit forks! READY TO EAT HEALTHY, SAVE MONEY & SPEND LESS TIME IN THE KITCHEN? Simply click Add to Cart and get ready to enjoy a watermelon filled summer. Also makes a great hostess gift or housewarming gift. In the unlikely event that you do not just LOVE this product, we will replace or refund your purchase no questions asked through our exclusive 1 year manufacturers guarantee. Premium Watermelon Slicer & Server (2 in 1 Kitchen Gadget) with 5 BONUS Appetizer or Martini Picks spend less time in the kitchen slice and serve your watermelon quickly and neatly (juice stays in the rind for easy cleanup!) serve healthy fruit salads to your family BONUS APPETIZER PICKS (5) imagine serving fresh mozzarella, basil & cherry tomatoes on these reuseable picks - impressive! cute as fruit skewers / kabobs with strawberries, cantaloupe, kiwi & pineapple skewer olives or fruit and use as cocktail or martini picks more ideas: shrimp cocktail, cantaloupe wrapped in prosciutto, antipasto skewers, strawberries dipped in chocolate - check out all our images! Wish you had more than 5? Additional picks available for purchase - scroll up to see coupons for buying 2 or more products Coupons start at $4 off! WHAT DO I GET? Quality watermelon slicer & cutter made of food grade safe stainless steel Instruction guide explaining how to efficiently use our slicer 5 Bonus Appetizer or Martini Picks Top notch customer care If you are ready to eat healthier, prep more quickly, and create beautiful appetizer presentations, purchase our watermelon slicer with bonus reusable picks now. The risk is on us, if you are not satisifed for any reason, return for a full manufacturer's refund for up to one year!